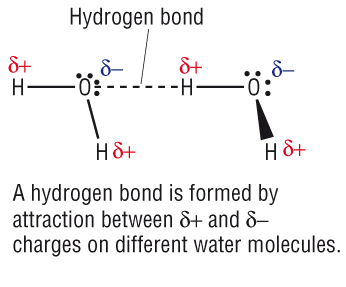 Conceptual Physics: What are Hydrogen Bonds? This bond may be considered as a special type of dipole bond, but it is one that is considerably stronger. It occurs between molecules in which one end is a hydrogen atom. When a hydrogen atom is covalent bonded to a relatively large atom such as Nitrogen, Oxygen or Fluorine a powerful permanent dipole is set up. This is because the electron cloud tends to become concentrated around that part of molecule containing the Nitrogen, Oxygen and Fluorine Nucleus, thus leaving the positively charged Hydrogen Nucleus relatively unprotected. Consequently a strong permanent dipole is created that can bond to other similar dipoles with a force near that involved in the ionic bond. A good example of Hydrogen bond is water molecule.